For the last few days I’ve been busy painting fruit trees before the cold weather arrives. I bought 18 cans of flat white latex spray paint, a sizable investment. My fingers got sore from all the spraying. 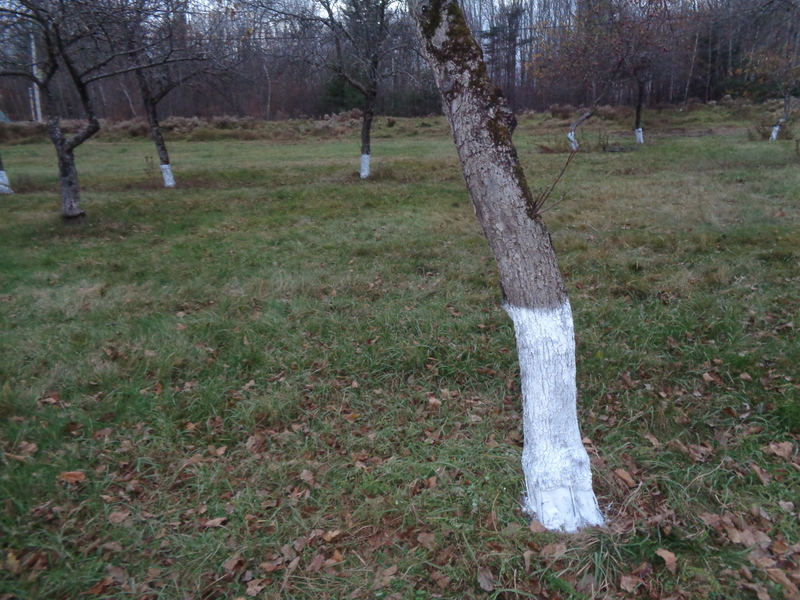 Most of the trees in the orchard got a coat of paint from the ground up at least 2 ft on the trunk, the average snow depth. Painting the trunks is supposed to deter the ravages of rodents who crawl through the snow and gnaw on the trees for sustenance during the winter. Last winter we had a glut of rodents and they killed several adult trees by chewing the bark off the roots, and girdled a bunch more. This past spring I made bridge grafts over the worse rodent attacks to try and save the trees. 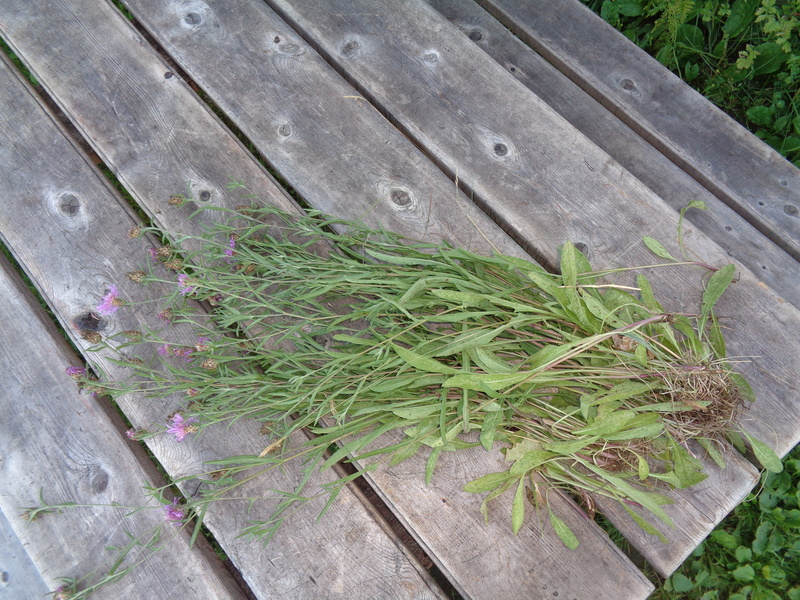 During the summer many of the grafts seemed to take hold. They are full and robust. The grafts that failed are shriveled. The tree below has several healthy grafts. To protect my work and, hopefully, the trees, I gave them all a good coat of paint. Rodents are rumored to not chew on trunks covered with paint. White paint is used because it reflects the winter sunlight, preventing the build-up of excess heat that can damage the bark. After all this money and effort, my fingers are crossed that the paint does its job. If not, we may need to say goodbye to our apple orchard. The majority of the original trees have died over the years, many killed by rodents. I hope we can save the hundred or so remaining trees. This morning I was stacking wood from a large pile that was split during the summer. The pile was about five feet high before I started, and fifteen feet wide, at least. It is made up mostly of oak and apple wood that has aged for a year. 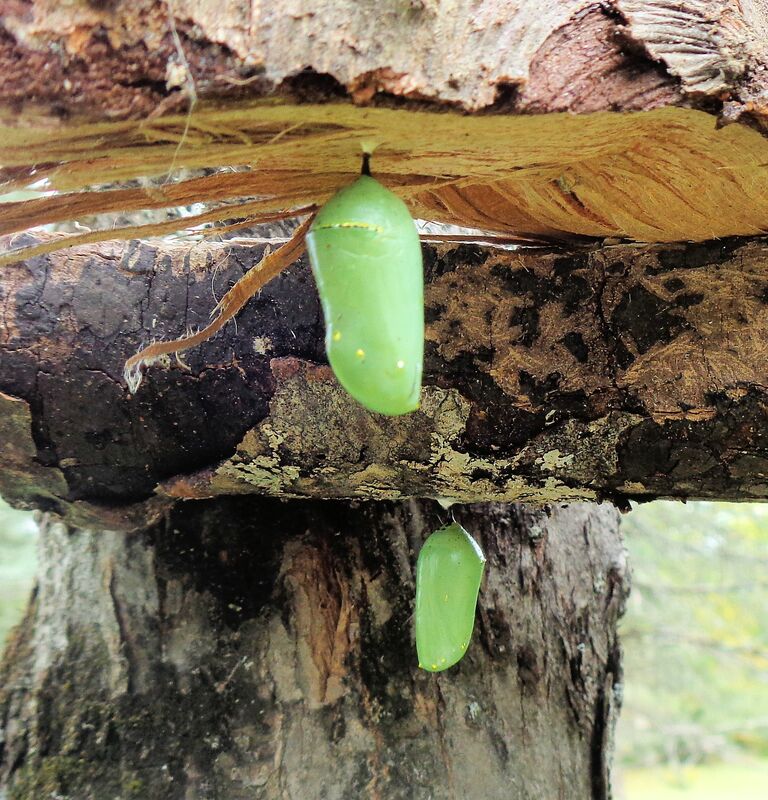 I was just working along, grabbing pieces of firewood and stacking them in neat rows on top of pallets, when I turned over a stick of wood and nearly crushed a monarch butterfly chrysalis. All summer I’ve been scouring milkweed plants in search of monarch caterpillars, eggs and chrysalises. I’ve had plenty of luck with finding the caterpillars, but no eggs or pupae. So I was greatly surprised to find this green case just lying in the woodpile! Dumb luck saved the insect from destruction. At any moment the stick of wood could have rolled or been jammed into other hunks of wood. I checked the chrysalis carefully and found no evidence of damage. Since the woodpile is not a safe place for baby caterpillars, I wedged the stick of wood in the branches of a crabapple tree. There the butterfly will be out danger and protected from rain. Then I returned to stacking wood, thinking what an unusual find I’d just made. About ten minutes later it happened all over again! I came much closer to squishing the second chrysalis. Just a whim of fate lay between life and destruction for the baby caterpillar as I grabbed several sticks of wood and tossed them together to make an armload. Once again I checked the pupa and found no damage. So I carried the second over to join its brother in the crabapple. Both caterpillars chose to pupate in close proximity within the woodpile. For the rest of the morning I used greater care when moving the wood, especially in that area. No more monarchs were found. As I finish stacking the pile, I will be on the lookout for any more silly monarchs! This species truly has the most beautiful chrysalis. It really looks like metallic gold dotted around the ends. Why nature expends energy to create a beautiful exoskeleton for a pupating insect is beyond me. It must serve some evolutionary advantage or it wouldn’t exist. The caterpillars in these chrysalises are still in the early stages of metamorphosis. They need ten to fifteen days to change, depending on the weather. The warmer it is, the quicker they develop. Temperatures are forecast for the 60sF-70sF during the day and no cooler than the mid-40sF at night for the next ten days. The baby insects should be able to grow. They will need to move out of this region quickly and head south. The frosts are on the way! 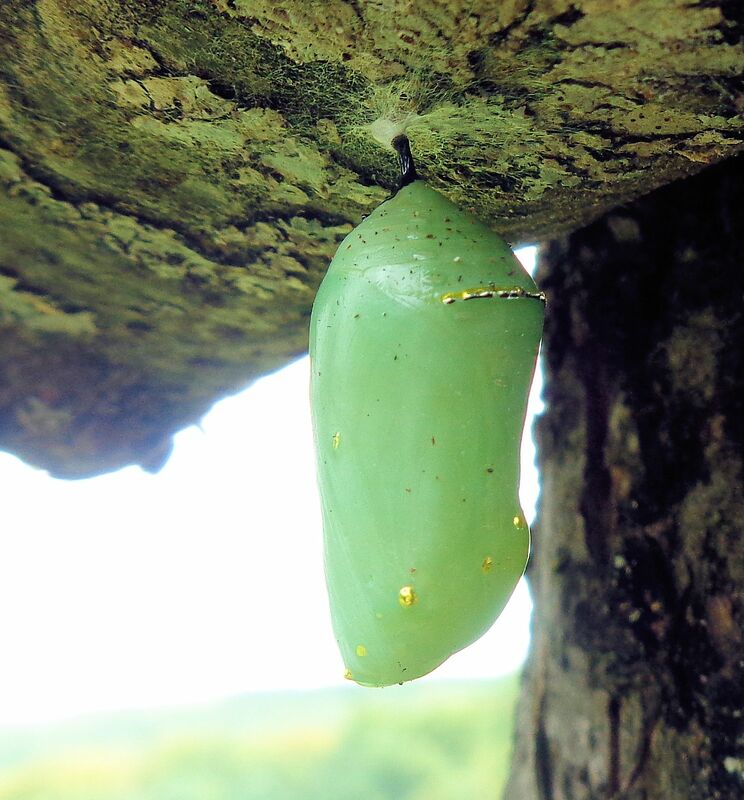 To form the chrysalis, a fully grown caterpillar seeks out a sheltered spot and hangs upside down by its two hind-most legs. It spins a small anchor of silk to keep it hanging securely. Then it sheds its skin to reveal the green exoskeleton. 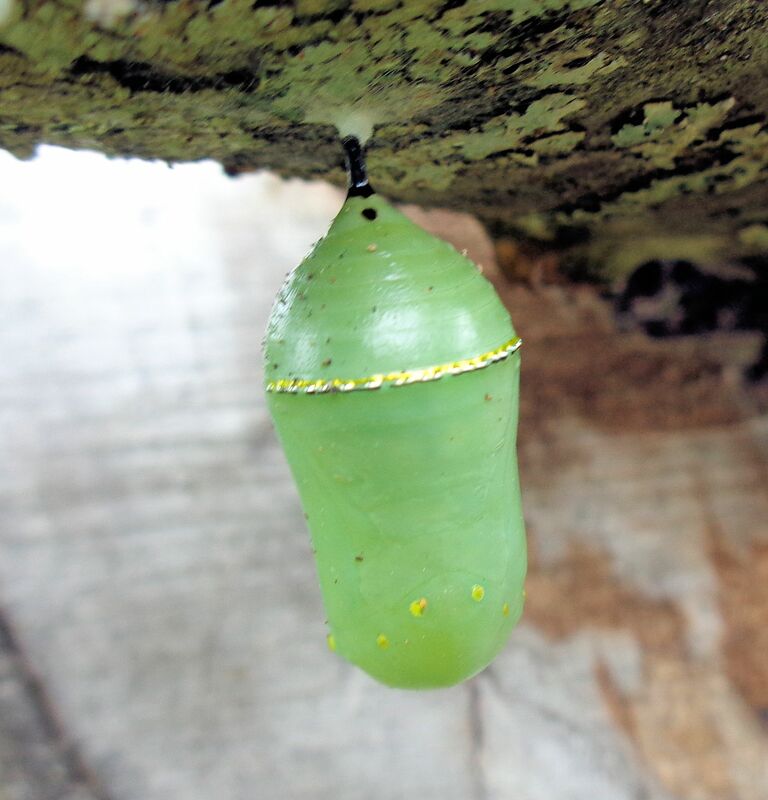 As the butterfly develops, the chrysalis will turn transparent and the lovely colors of the monarch wings will be visible within. 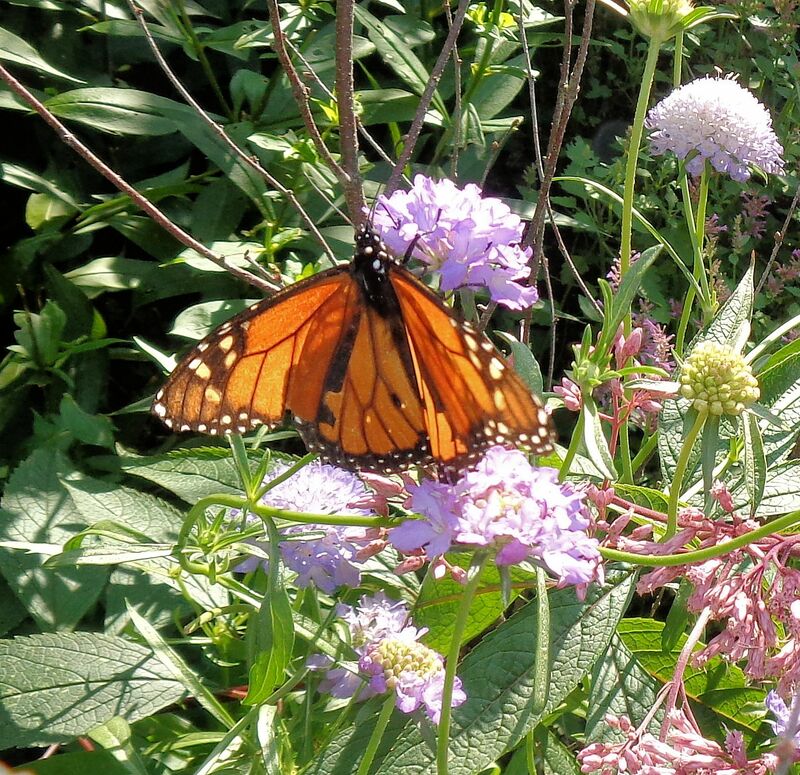 Here is an adult monarch I saw recently in a butterfly garden on Mt. Desert Island. I’m hoping the insects continue to develop and I’m able to get some photos of the transparent stage and of the emergence of the butterfly. I’ve read they emerge mid-morning on a warm day. So, I will keep a close eye on these baby butterflies. 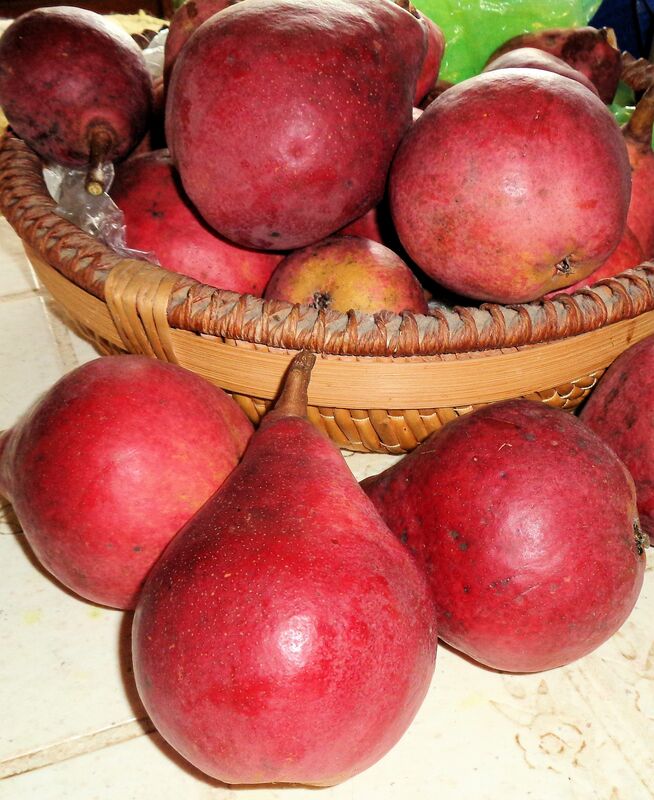 The red pears are ready during the first part of September. These early organic pears are delicious, fragrant and sweet, but they don’t hold long. They must be picked when they are still a little crunchy and ripened under close monitoring. In a couple days they can go from perfect ripeness to all brown on the inside. The ones that survive my appetite for fresh pears are turned into jelly. 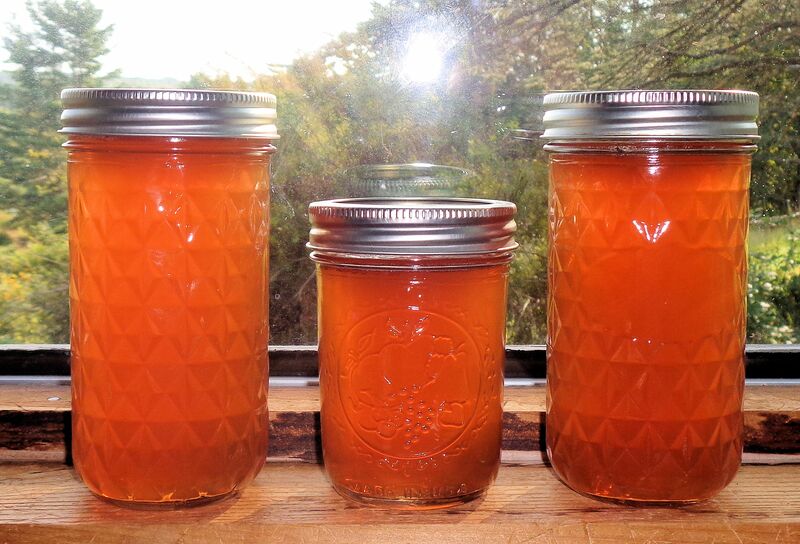 My pear jelly recipe was developed through trial and error and adapted from the apple jelly Sure-Jell recipe. Pears have a similar pectin content to apples, but they contain more juice and are sweeter. To make perfect pear jelly, select ripe fruit that is still slightly firm, not gone too mushy. The skin and cores contain pectin, so they are retained. The low sugar version of Sure-Jell reduces calories and allows more of the fresh fruit flavor to come out in the finished jelly. Wash pears well, remove stem and blossom end. Cut the fruit, with the skins and cores, into approx. 1″ cubes. Place in a large saucepan with the water. Simmer, covered for 20-30 minutes, until soft. Mash the fruit, place in a jelly bag or within several layers of cheesecloth and drain off all the juice. I like to put the juice in a covered pitcher in the fridge overnight so any pulp that makes it through the cloth will settle to the bottom. Then I pour off the clear juice, leaving the sediment. You should have 4 cups of juice. Add up to 1/4 cup water if you are a little short. Place the juice in a large stock pot that is at least four times the volume of juice to allow for expansion during cooking. Mix the Sure-Jell with 1/2 cup sugar then add to the juice. Cook on high, stirring, until the mixture boils. Add the rest of the sugar all at once. Continue to stir and return the mixture to a full rolling boil that can not be stirred down. Boil for one minute. Remove from heat. Skim off any foam. Immediately pack in hot containers. Process in a hot water bath for 5 minutes. Cool out of drafts. Check for a seal before storing. Makes about 6.5 cups of jelly. Yum! A couple weeks ago I blogged about the extensive damage done to our trees this past winter by an overpopulation of rodents. A couple dozen apple trees and several ornamentals were chewed extensively. Some were girdled. 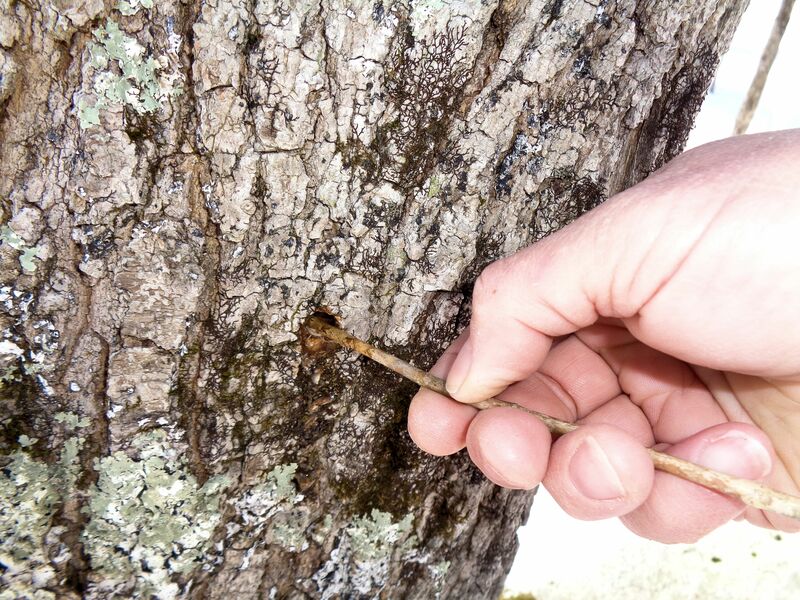 To save the girdled trees, an emergency repair of grafting is attempted. 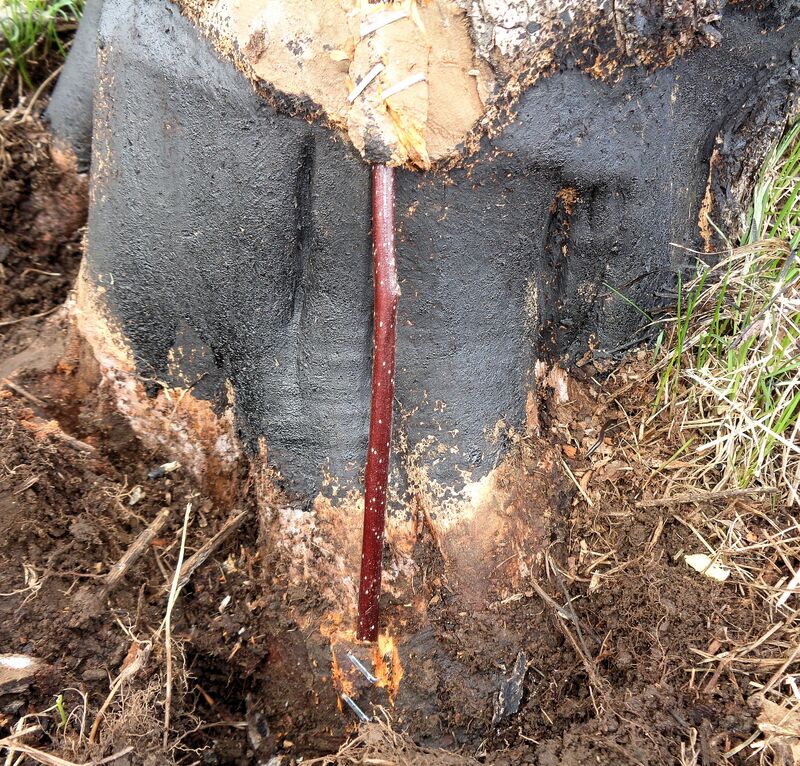 If the graft takes, the tree will be able to send nutrients back into the roots so the plant can survive. 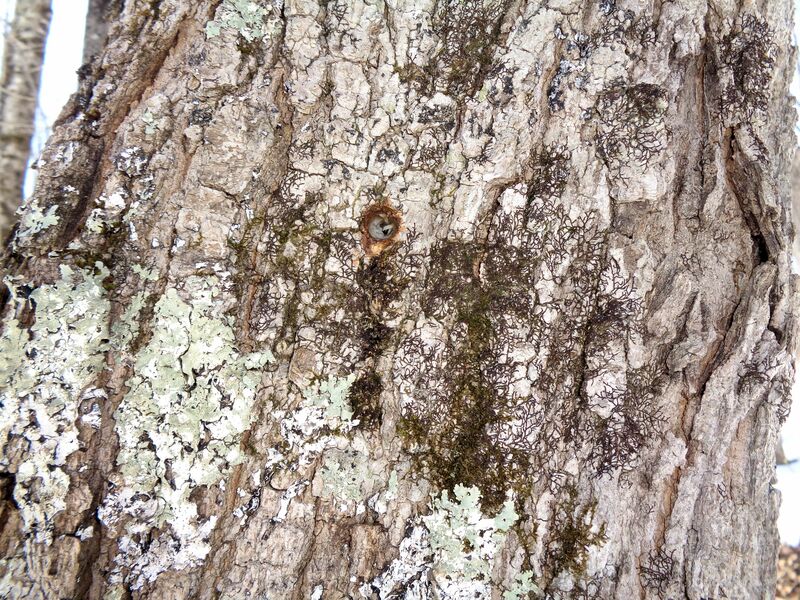 Without help, trees that have had all the bark removed around the trunk almost always die. 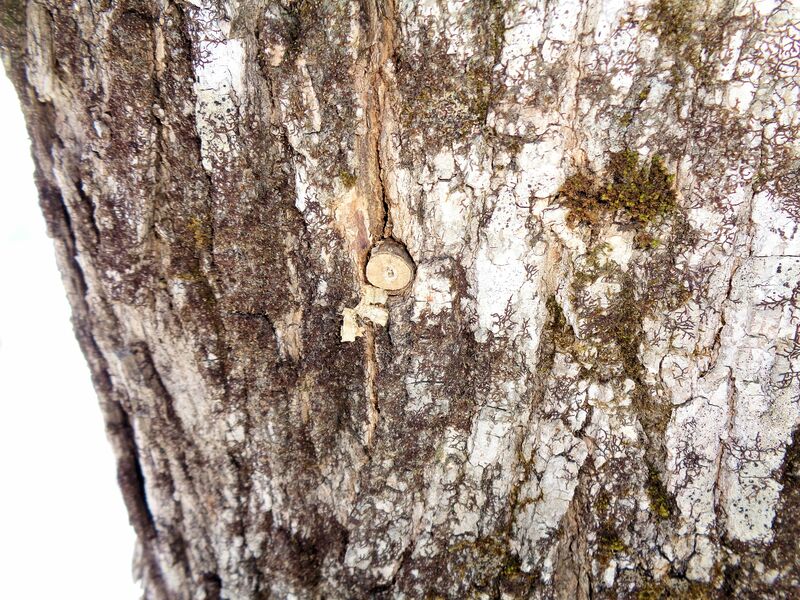 In a normal winter, there is some rodent damage, especially to young trees. That’s why I protect young trunks with tree guards. By the time fruit trees reach forty-plus years old, rodents do not usually cause severe destruction as they gnaw on the inner bark to survive. A little gnawing can be healed. This last winter there were so many rodents, especially voles, present in the fields and orchards that they were forced to forage in unusual places to find enough food to survive. 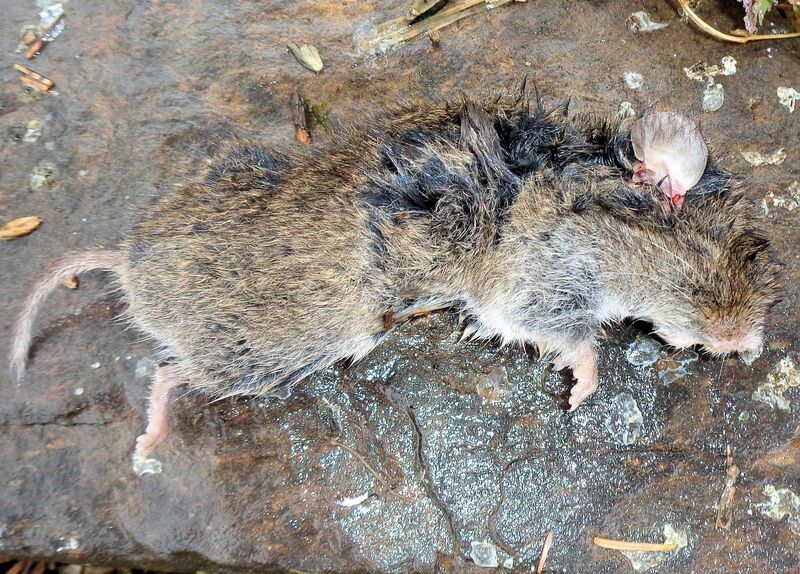 Here is a somewhat grisly photo of a vole the cats killed. The silly thing wandered into the cats’ outdoor cage. These vermin are the main culprits in tree destruction. They have rectangular shaped bodies with short legs, lots of teeth and stubby tails. Voles can grow up to six inches long or more, not including the tail. 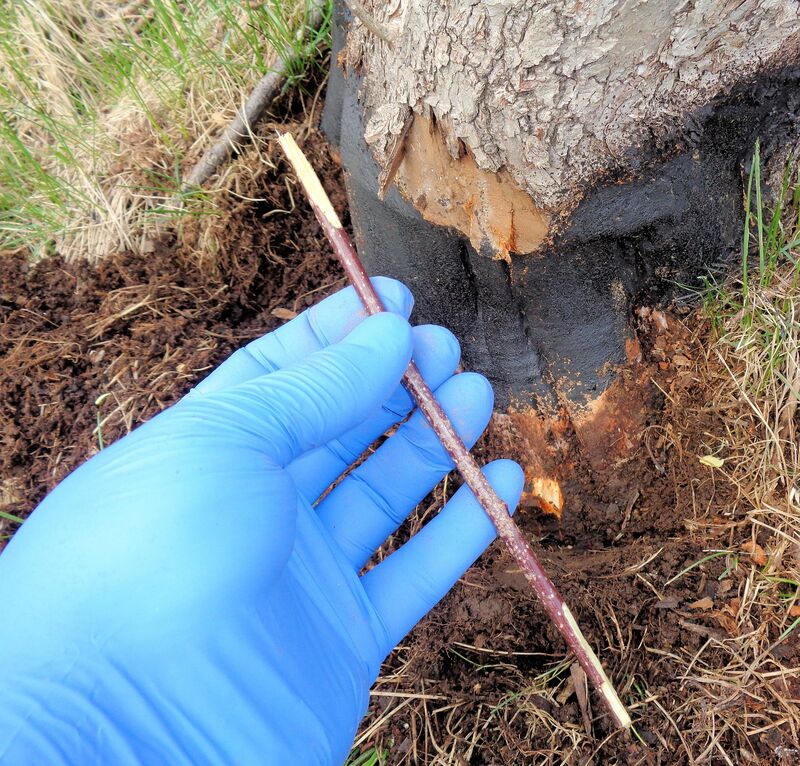 To perform the life-savings grafts, it is important to harvest a bunch of one-year-old scion growth from the same species and preferably the same tree as the one being grafted. The scions are collected in early spring while they are still dormant. They are closely wrapped in plastic and stored in the fridge until grafting time. 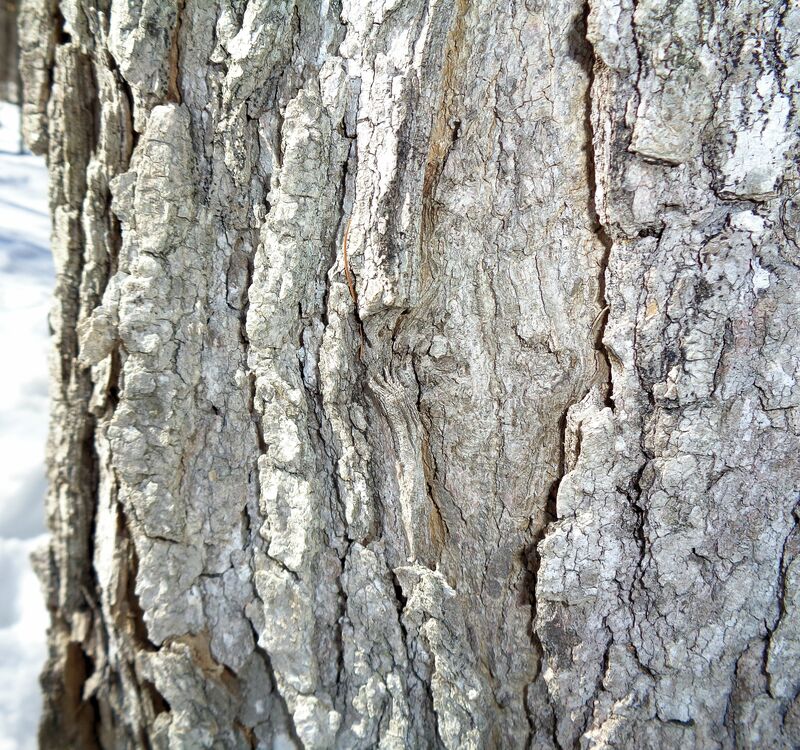 When the trees begin to bud and sap is flowing, the bark loosens and can easily be slipped free of the trunk. Budding time is when grafting is done. When I collected the scions I also applied wound spray to the poor girdled trees to help preserve moisture, which is why the gnawed area is black. 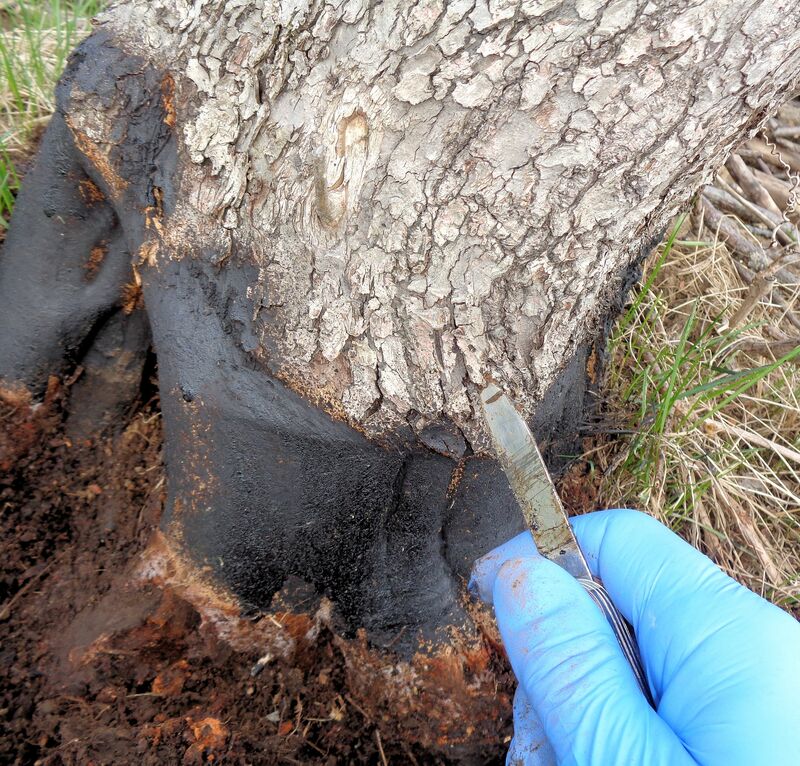 Using a stout blade, I cut two parallel incisions into the bark above and below the injury. The blade is used to gently work the bark away from the trunk, exposing fresh wood. A flap of bark is left to protect the grafting sites. A scion is selected and trimmed to the proper length. Both ends are shaped to slightly sharpen and form a smooth surface of fresh wood. The graft is inserted into the bark flaps of the tree, assuring the freshly cut surfaces press against one another and the tip points upward. Then I use a staple gun with 1/2″ staples to secure the graft to the tree and hold the bark flaps in place. Over time the staples will rust and dissolve, leaving the graft to grow unimpeded. I give the grafted scion a test tug to be sure it is held tightly. The scion is placed with a slight outward bend so it can move with the swaying of the tree trunk as the wind blows. This will help the graft to stay in place. Then I thoroughly coat the entire repair including the scion with wound spray to seal out insects and disease and seal in moisture. 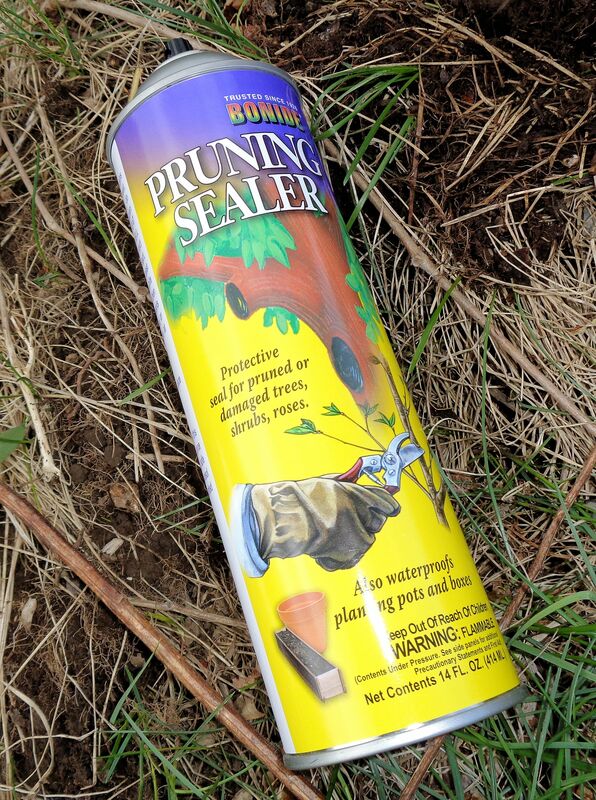 Any good tree wound spray will work for this procedure, I am not endorsing a particular brand. I used up five cans of spray this spring. These major injuries that remove the tree’s link between the roots and leaves require many grafts placed around the trunk to repair. They can be placed every 2″-3″. With so much work to do, the most grafts I managed to place on a tree were six. If they take and the trees hold in there, I can add more this fall or next year. As the grafted scion grows into the tree, it will gradually enlarge. I’m hoping the tree will also grow bark to help cover the wounds. Some of the damaged trees may not survive. The rodents actually dug down to the roots and chewed the bark off the roots. There is not much I can do to prevent or repair that damage. 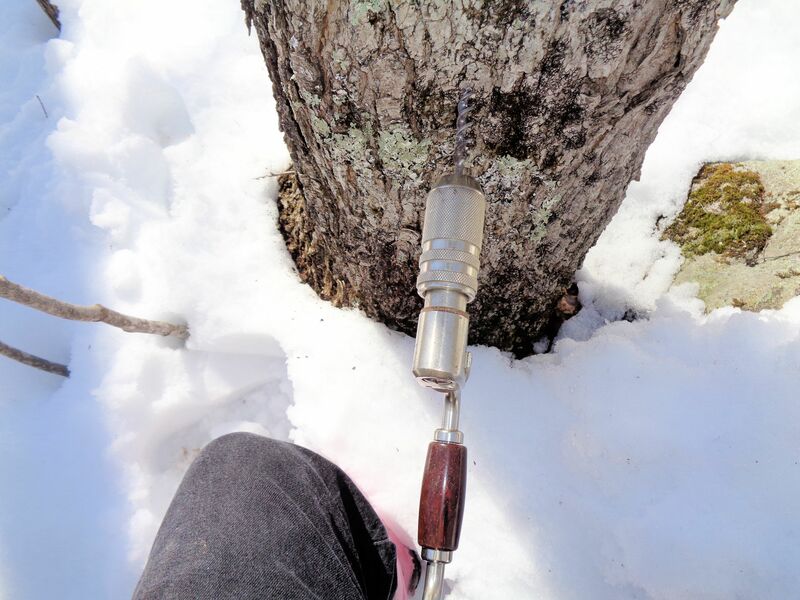 A little research reveals that orchardists have success repelling rodents and rabbits by painting the entire part of the trunk and even the lower limbs that are buried in the snow or within easy reach of rabbits in winter. So far I have not encountered any rabbit problems. 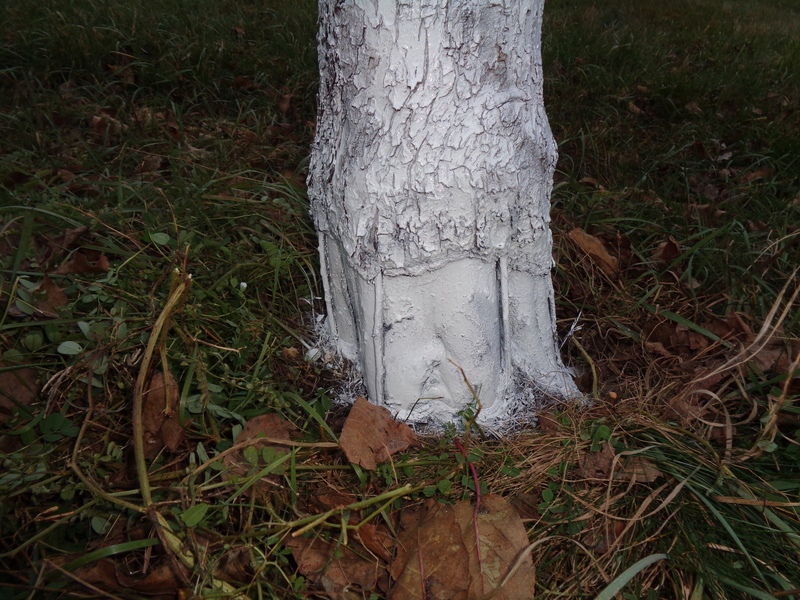 I plan to coat the tree trunks with white latex paint prior to this fall. Maybe that will slow down the gnawing critters. 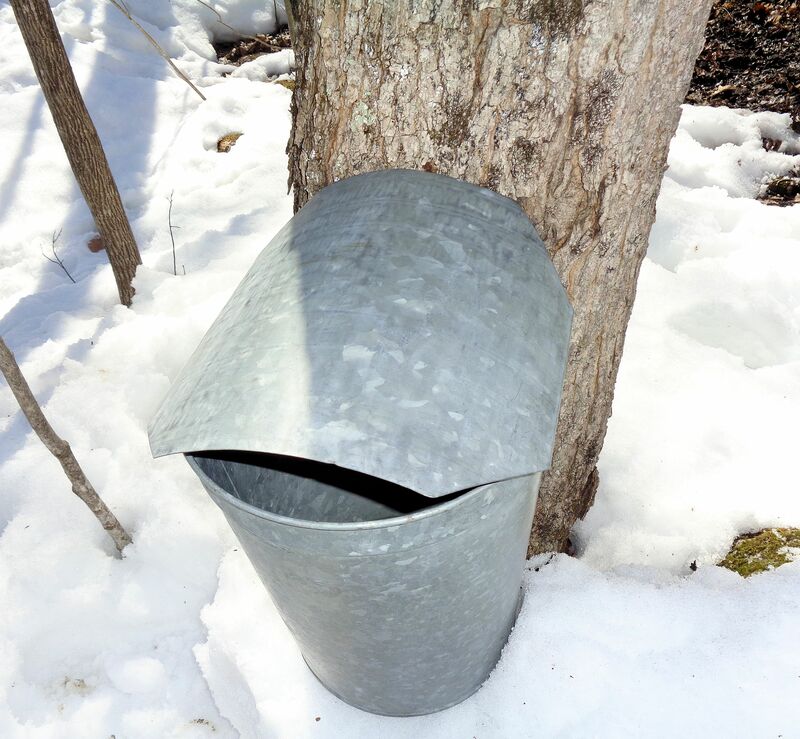 Maple syrup season is in full swing here at the farm. I tapped three days ago and have filled the 50 gallon boiler tank. Today is the first day I’ve fired the boiler. By tomorrow evening we should have over a gallon of fresh syrup if all goes well. 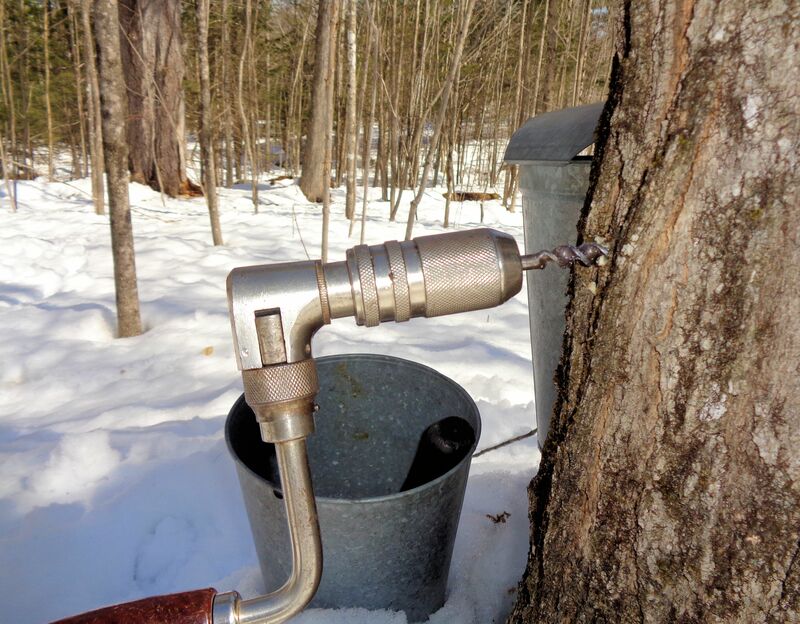 Here at Phoenix Farm we make maple syrup much as the ancestors did hundreds of years ago. Improvements were implemented over the years with the development of galvanized buckets to replace the old wood ones, better spiels and a more enclosed method of boiling the sap to keep the smoke out. Syrup was once made in open containers over open fires. 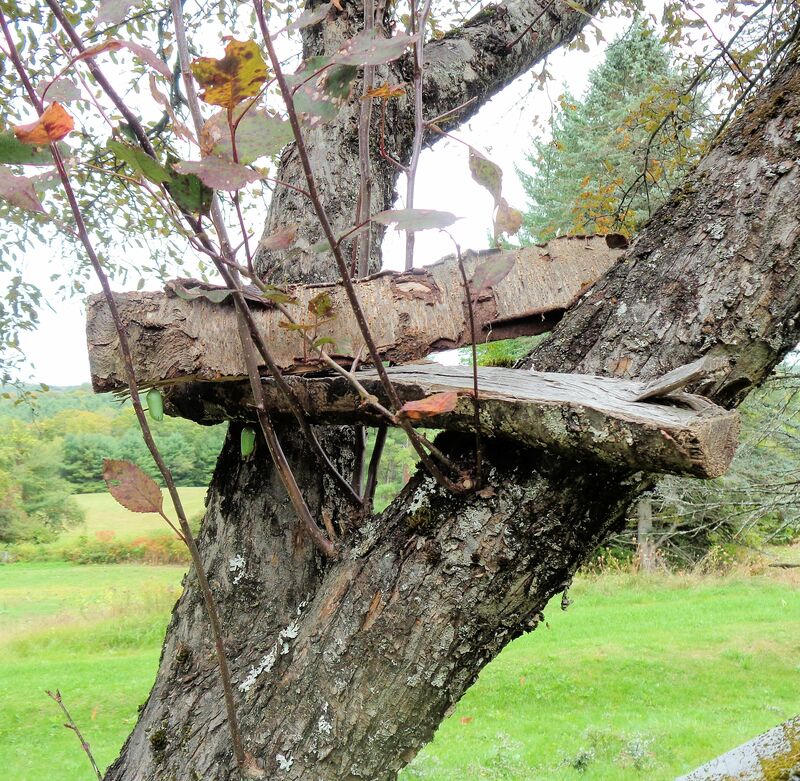 Generally, we collect and process sap much as was done in the 1700s here in New England. I prefer the old fashioned way. Besides the nostalgia factor, using metal rather than plastic for long term sap contact alleviates concerns of plastic contaminant leaching. There is an art to drilling and caring for tap holes using the old methods. 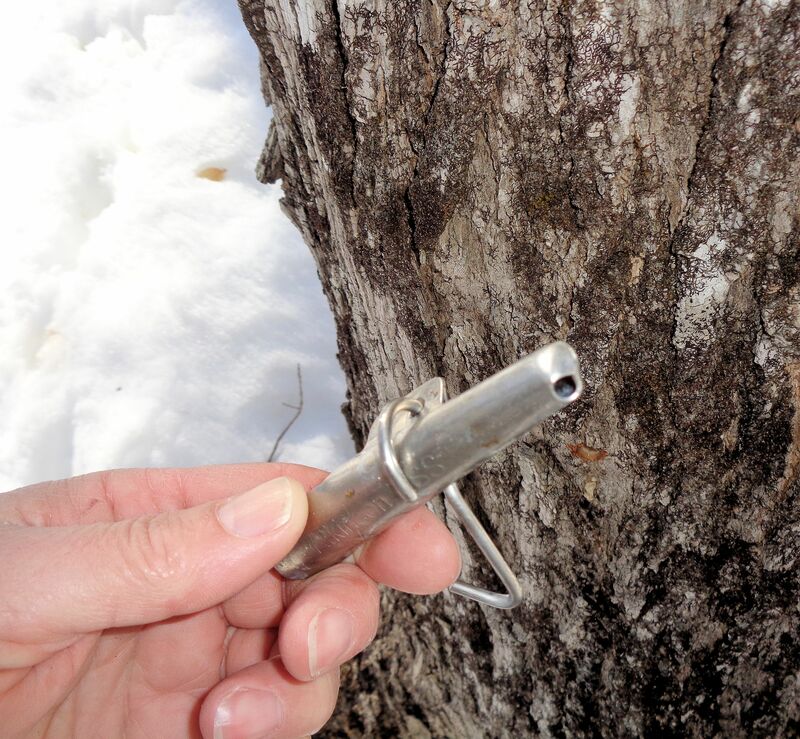 It is helpful to tap on a day when the sap is running so you know the hole is patent. Dry holes are no good to anyone. 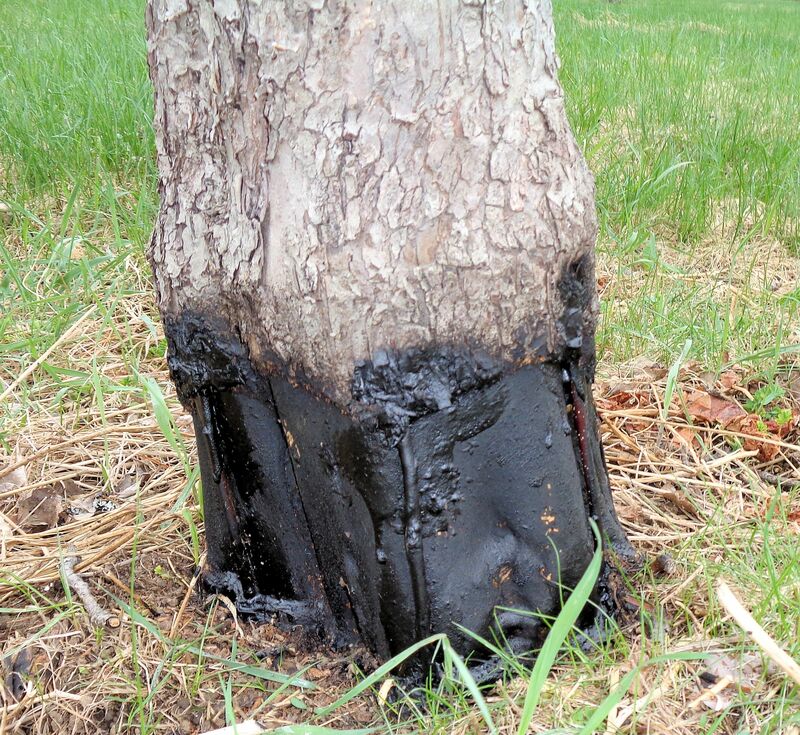 Sap season occurs when air temperatures are in the 40sF during the day and 20sF at night. I use an antique manual bit and brace drill. Choosing the correct drill bit size is essential. Too large or small a hole can lead to tree damage. The correct size to fit standard spiels is 7/16″. The spiel must be straight and perfectly round to fit snugly in the drill hole. 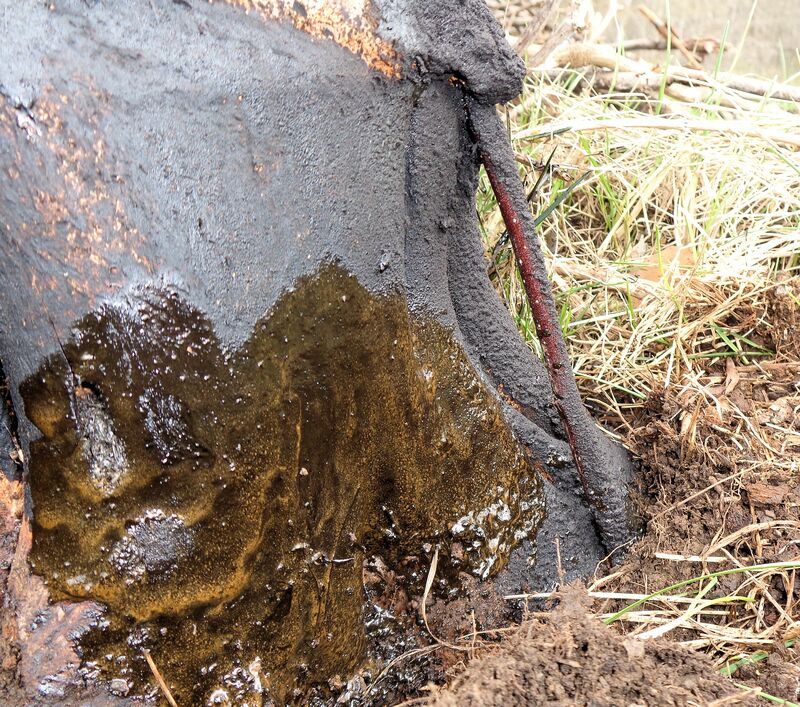 The materials required for tapping are the drill, a hammer, a study twig about 6″ long, spiels and buckets with lids. 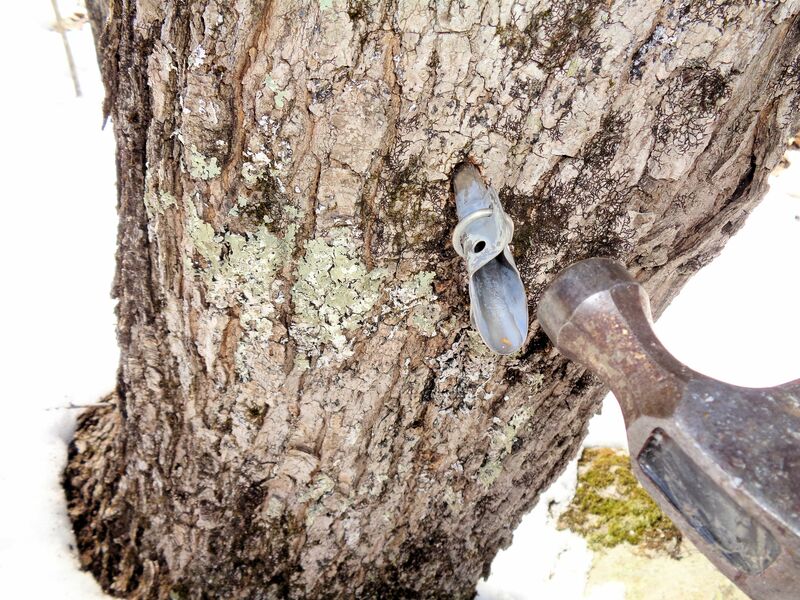 Some lucky people also have a spiel driver which is a solid piece of metal that fits inside the spiel and allows you to hammer it into the tree without a chance of damaging the spiel. Someday I will afford a spiel driver! If the trees are being tapped in mid to late March, try to drill on the more shady northern, northeast or northwest sides of the trunk. This helps protect the sap gathering in the bucket from getting too hot in the warm afternoon sun. Sap must be kept chilled or it can spoil. The hole is drilled with a slight downward slant to encourage the sap to run out. Too steep a drill angle will allow the spiel to pull out when it holds the weight of a full bucket. The holes are drilled between two to five feet from the ground. Trees can be tapped when they reach ten to twelve feet in diameter at chest height. 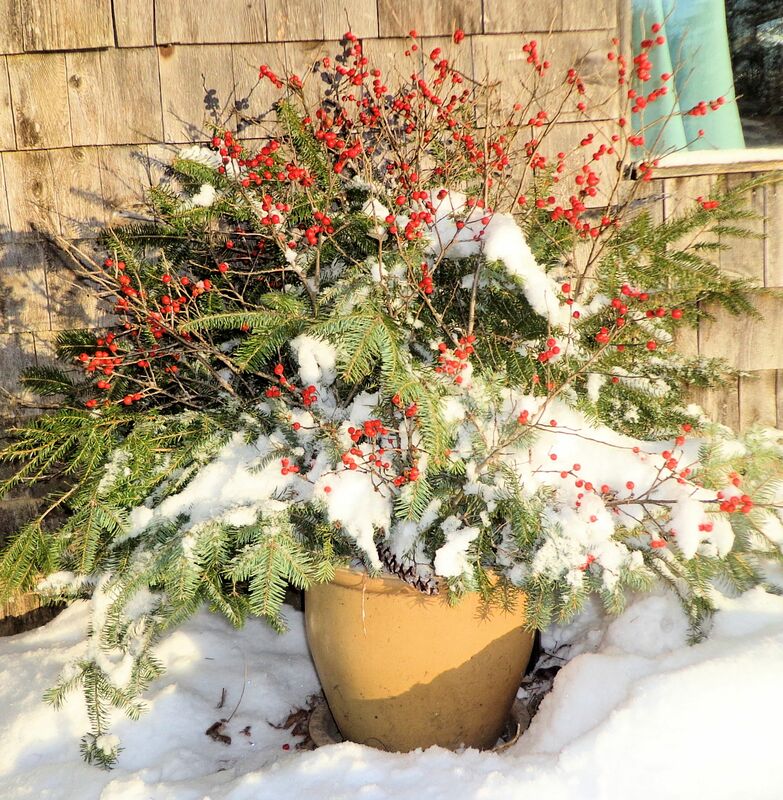 I put one bucket on smaller trees, two buckets on trees larger than fifteen to twenty inches in diameter. We have so many trees in the maple orchard that we don’t need to triple tap any of them. It is safe to place up to four taps on a very large tree. Drill the hole smoothly and evenly with no wobbling of the bit. You want the hole to be straight so the spiel will fit flush, containing the sap and sending it out through the spout into the bucket. Sloppy, loose holes leak and leaky holes are a waste of sap and time. 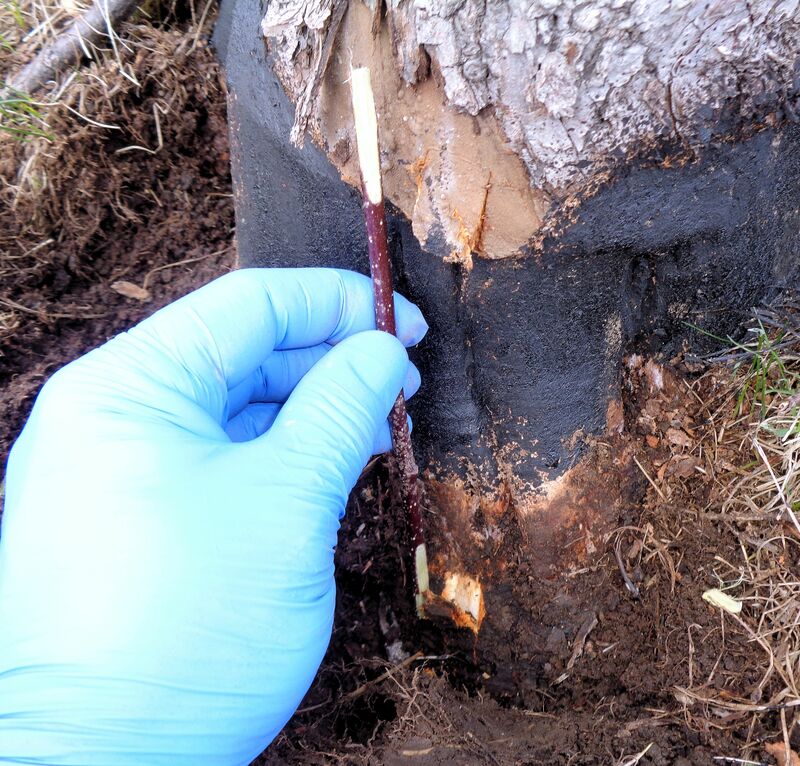 Drill in about 2.5″ to reach the xylem, where the sap travels inside the trunk. 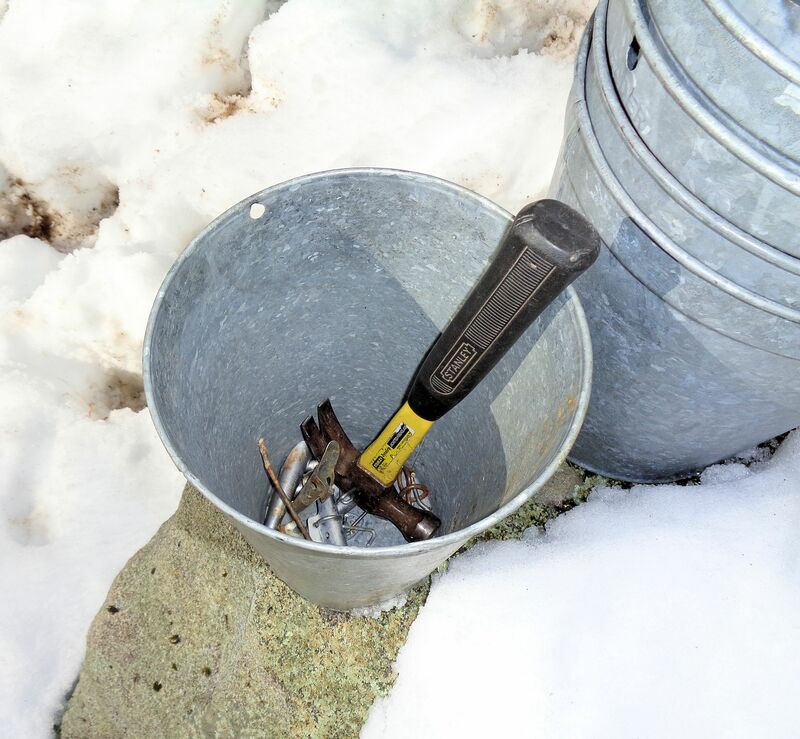 Use the sturdy 6″ twig to clean any drill dust out of the hole. Then, use the hammer to gently tap the spiel on the wide area above the spout to drive it into the hole until it is just snug. A spiel driven in too deep can split the trunk, greatly damaging the tree. A spiel that is too loose is in danger of falling out when the bucket gets full. When the sap starts to run out the spout, I clean the first of it away since it will be full of bits of drilling dust. Finally, hang the bucket on the spiel and pop on a cover. It takes me four to five minutes to complete each tap. On a nice, warm afternoon in March when the sun is shining and the temperature is around 45F, the sap will practically pour from the drilled hole. 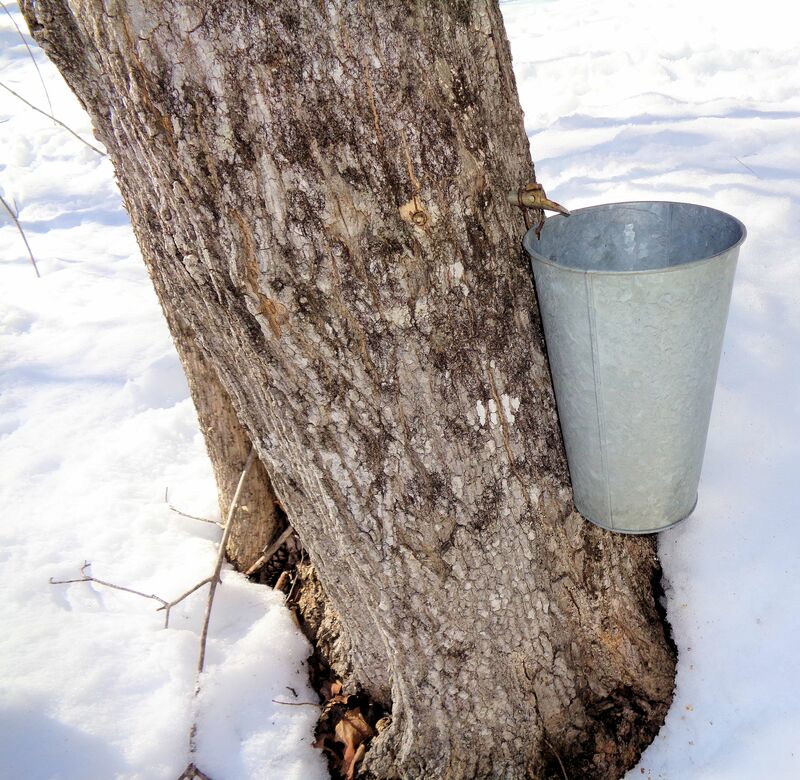 Each tap hole produces between one to two gallons on a day when the sap is running well. Temperatures below the 40sF, cloudy, cool days and chilly, windy days reduce sap production. 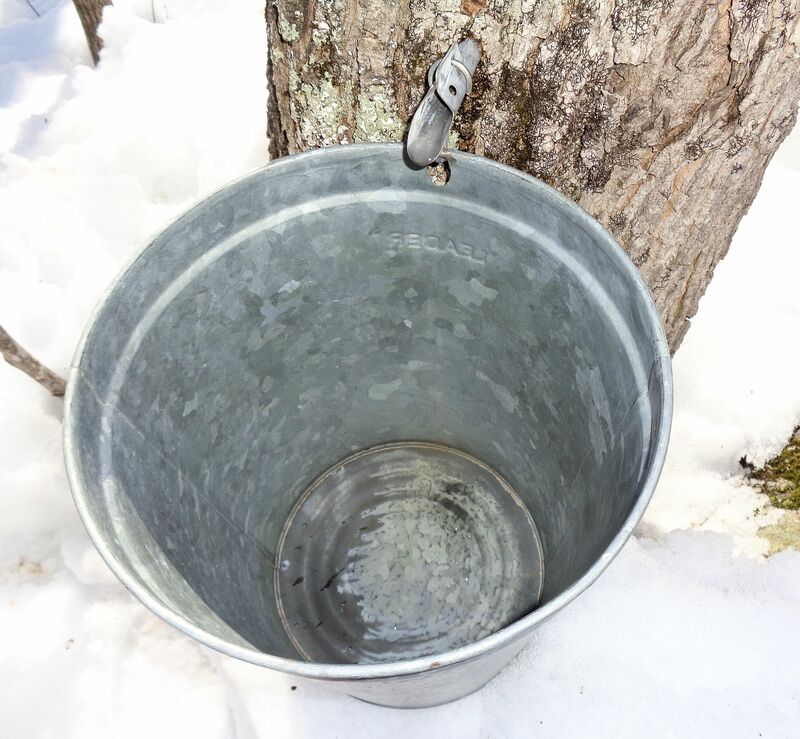 After the trees are tapped, (we have twenty-five taps this year,) it takes two to four days to collect enough sap to fill the boiler pan, depending on the weather. 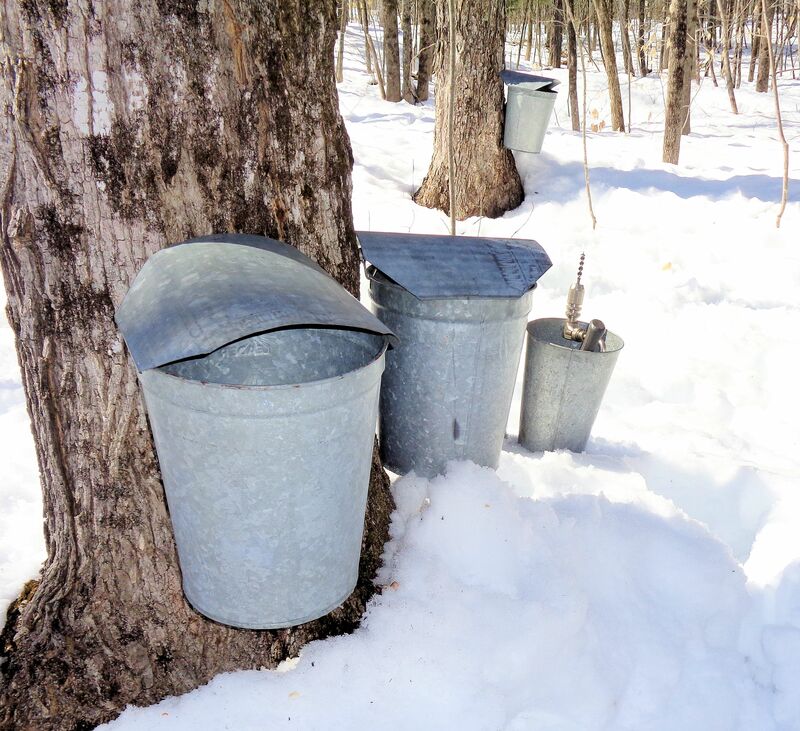 The average ratio is forty gallons of sap produces one gallon of syrup. I suspect the soil in our maple orchard encourages very robust trees because they gives us a little more syrup per gallon of sap. More like 35:1. Once temperatures are sustained above freezing at night, the maple trees begin to bud: their leaf and flower buds are swelling in preparation for opening. Budding signals the end of syrup season. The sap becomes dark and bitter. To me, care of the tap holes at the end of the season is as important as at the beginning. Certainly, there are plenty of people who will swear that all you need to do is pull out the spiel and let the tree alone. 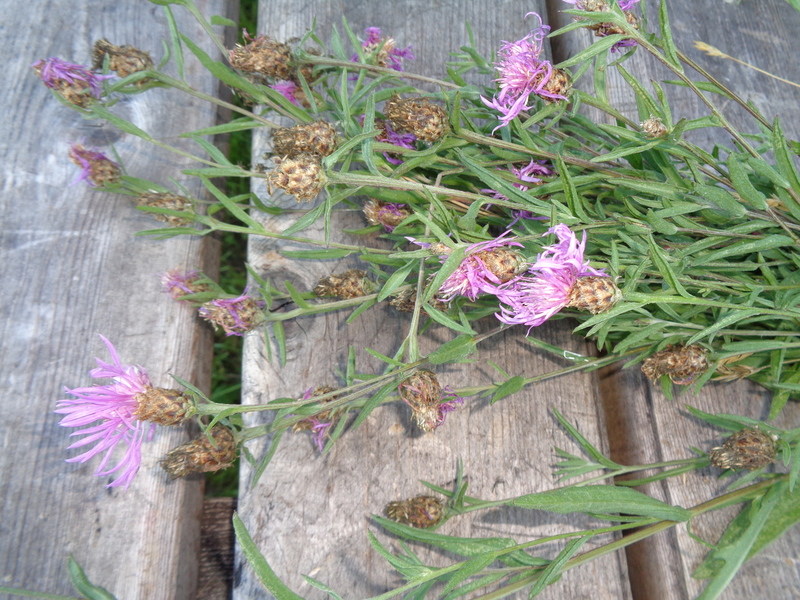 The sap that bleeds out in profusion from the holes is not a problem for the plant, some claim. I ignore this advice. It makes sense to me that a bleeding tree is losing energy. It also is obvious that an opening that leads 2.5″ into the trunk of a tree is an invitation for insects and microbes to invade. At the end of the season, I use the hammer to gently tap each spiel out of the tree. I cut ash saplings selected to fit snugly in the opening. Using ash rather than maple saplings reduces the chance of introducing disease into the tree. I peel and whittle the sapling, as necessary, until it perfectly fits the hole. Then I cut off a piece about 1″ long and tap it into the hole. The chunk of sapling acts as a plug. 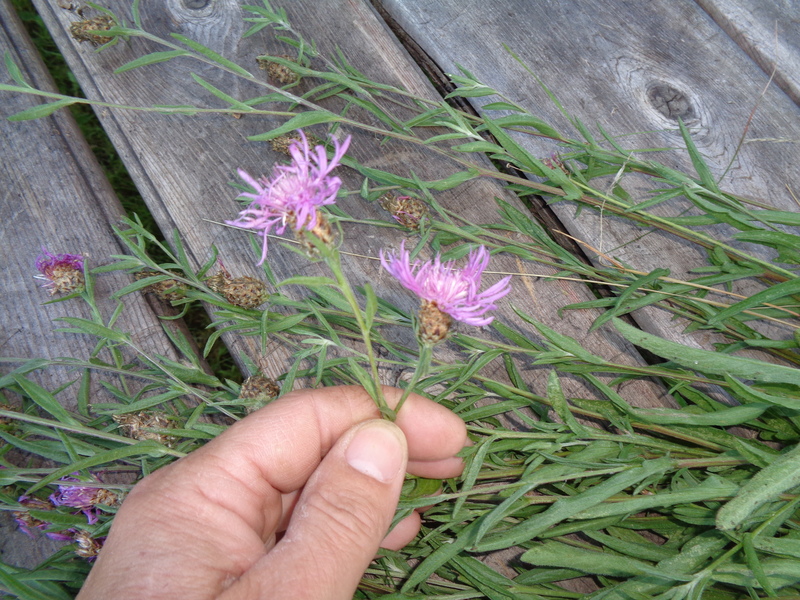 It greatly slows the loss of sap. 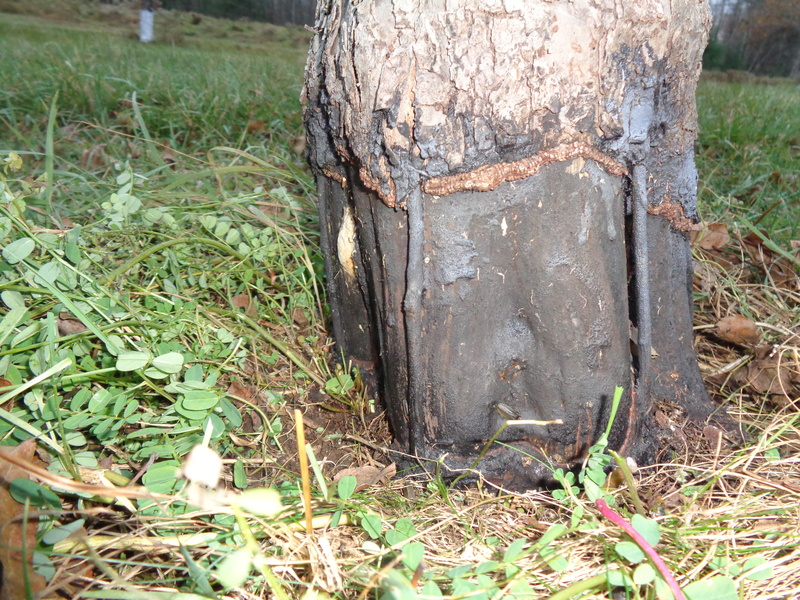 As the tree heals, new wood forms inside the hole and pushes outward against the plug, popping it out of the trunk. Filling the hole completely with foreign wood so that the plug remains in the tree will damage the plant since it creates a dead space in the trunk. In the photo above, the plug placed last year is on its way out of the hole. Below is a well healed old tap hole. Improper drilling can create catastrophic results for the tree. When a tap is driven in too hard and the trunk splits, the wood below the hole dies. 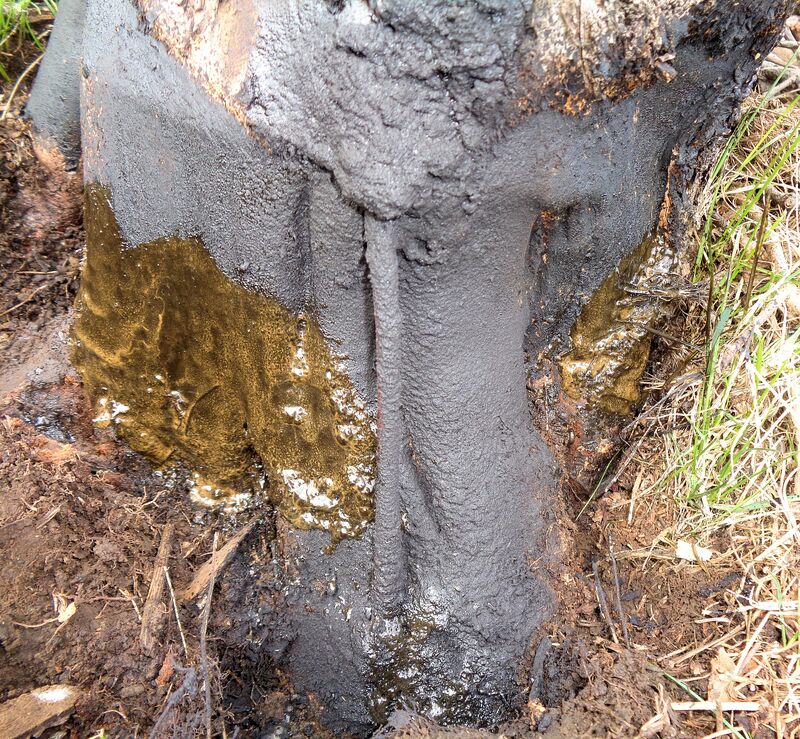 A wide section of the truck is lost, resulting in a hole in the tree near the roots and much dead wood. When I first started tapping maples, I made the mistake of splitting the trunk a few times and damaged several trees including this fairly young one below. There is a big hole on the left lower side. This tree still produces plenty of sap and is healthy, but some do not recover from the damage. They are weakened to the point where they have to be cut down. 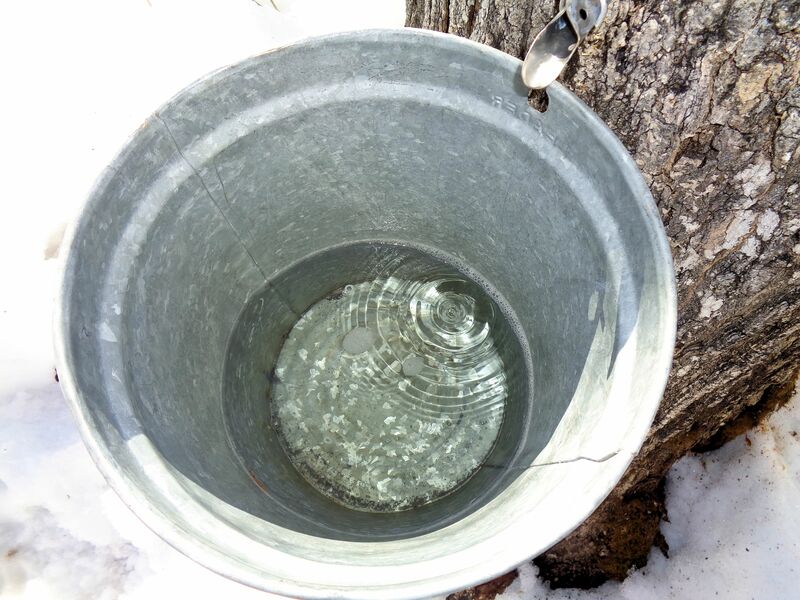 One of the joys of maple season for me is listening to the sap drip into the metal buckets. Quite a cadence can be heard of a warm afternoon. So that others might enjoy this rare tree music, I’ve made a couple short videos of the dripping sap. Notice in the close-up shots how the hydraulic force appears to create a heartbeat-like rhythm.